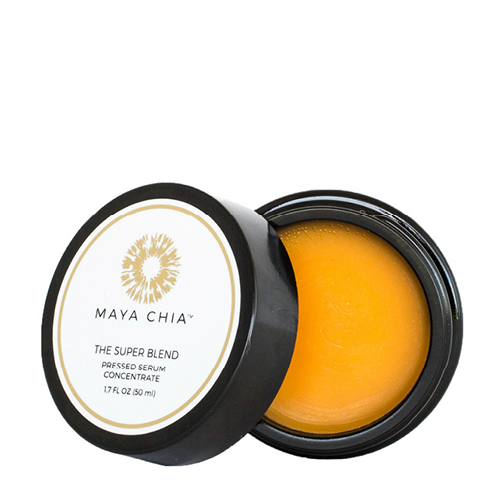 The Super Blend by Maya Chia is an innovative ‘pressed serum’ that is supremely concentrated. This formula packs a super-sized dose of nature’s most highly effective ingredients, including the potent antioxidant astaxanthin, vitamin c, omegas and polyphenols that together make up this effective balm for a youthful appearance. The formula is further fortified with co-enzyme Q10 to help soften the look of wrinkles, while babassu and kokum butters and white lupin seeds boost a look of skin radiance. This luxurious and powerful combination gives a revitalized look to aging skin by toning down the appearance of oxidative stress and inflammation to increase a look of elasticity and firmness. Use balm AM or PM as desired. For the face, smooth about a 1/2 or 1/3 pea size of balm between your palms and fingertips and press palms together to melt. Press palms firmly all over face for 40-60 seconds to warm blend and help it spread onto skin. Apply the Maya Chia pressed serum on the décolleté area AM and PM as desired. Warm a 1/2 pea size of the balm between the palms and press along the collar bone line and neck. Words cannot describe how my skin looked and felt after adding this product into my routine. I highly recommend! Love the faint scent too. I'm in love with this product! Not only is it smells amazing, but also works great. Soo nourishing and hydrating! I've been using this a weeks now, typically at night. I wish it was a little more liquified, as I have to rub my finger round and round to pick up some product, and then I feel like I only got a tiny bit to smear on my face in one stripe - it feels like I'm applying it in patches only. Where to begin! This is an amazing balm. The bright orange color and delicious natural smell has my skin cells doing pirouettes. I only use this at night as I feel it's too dewy under foundation and SPF. This is a great hydrator after my retinol and Maya Chia Super couple. I'm such a balm girl! My only wish is that the jar showed an expiration date. Tipping my hat to this product and it's amazing ingredients! This pressed serum is a treat! Very Calming, hydrating, firming! Smell is incredible. I recommend misting over top and continuing to press in. No other serum or moisturizer needed.